About Works Services Composer Blog Need Music? With a range of services that caters to your every need, you know your project be given the specific attention it needs on every level. Creative consultation on music composition and arrangement. Musical styles include epic orchestral, Asian ethnic, inspirational, romance, classical, jazz and comedy. Audio branding is the approach of using unique, proprietary sound and music to convey a brand's essence and values. Just as visual branding defines a brand using color and shape, audio branding defines a brand through sound and music. Voice casting and dubbing for movies and documentaries by established voice talents in a wide range of languages including English, Mandarin, Japanese, Korean, Hindi, Spanish and more. Sound can be an incredibly powerful tool in communicating a strong brand statement, and we harness this strength in emphasizing a product's unique selling point with the quintessential "audio logo". So you're working on your first game, short film or even started a podcast series, and now you're ready to add music to your project. You might be at that crucial point where you are undecided between hiring a music composer or licensing stock library music, due to budget constraints or just the apprehension of not knowing how to work with a composer. Here are top 3 considerations to make that will help you weigh your options better. Have you already got a specific "sound" in mind for you project? Try communicating that to the composer with references to existing music from streaming services like Youtube and Spotify. This allows the composer to quickly understand the music style you desire, and spend less time on second-guesses with multiple drafts. It will also allow you to pick the right composer whose style and work fits your aesthetic closely, rather than squeezing a pumping electronic dance track from the hapless classical composer. Of course, not everyone starts out knowing what kind of music style suits their project. The easiest way around this is to contact a music composer, and explain the creative goals behind your project. Being a seasoned music professional, the composer will be able to suggest a few music styles that could fit your project perfectly. It is important to decide early on much you are willing to spend on music in your project. There are always many production options in creating a music piece that range from highly affordable to elaborate arrangements. Conveying your budget clearly to the composer at the start of discussions would help the composer accurately quote you with the best musical option available at the price range. Being aware of the process behind the music creation allows you to properly schedule the time frame allowed for music within your project planning. Once the style of the music has been agreed upon, the composer will produce drafts which are structurally completed but partially arranged. The draft will contain less instruments (eg. only piano instead of a full band) but will be complete songs with melody and harmony. Once you have given feedback on the drafts (eg. "I need this part of the music to be shorter" or "can we have an impact at this point in the music"), the composer will fully arrange the music tracks with complete instrumentation. Note: At this point, no more changes can be made to the music style or structure. 2) Record the music with live musicians (expensive but top quality sounding). As a general rule, the emotional sincerity from live musicians is what sets your music apart in a positive way from the electronically produced cookie-cutter music common in today's media. After recording, mixing will take place whereby individual elements within the music will be balanced out and effects will be added to enhance the sonic profile. The music then goes on to being mastered, which involve optimizing the music to sound great on as many audio playback systems as possible, with the option of focusing entirely on a a single playback system (eg mobile phone). If your project is a music album, the mastering will ensure every track's volume is consistent with each other. 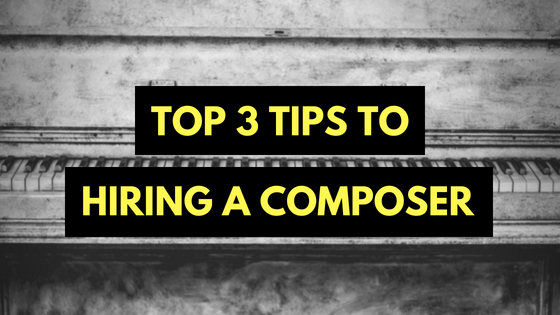 Hopefully the pointers above help to demystify the process of hiring a music composer for your project. If you have any more questions, I’d be happy to hear from you. Drop me a message now and we can get talking! Get the latest updates and articles in our monthly newsletter. © 2018 by A Sound State. All rights reserved.